Purchase a full-price ticket from the venues listed above and add extra attraction(s) at a reduced rate. Price is per person, per offering (same day only). *Member rates are limited to the number of Exhibit Halls admissions permitted with your membership level. You don’t have to be part of an organization to take advantage of our special group rates and amenities. We can help plan a special outing for you, your family, your friend, or your organization. Groups of 15 people or more qualify for our group rates! 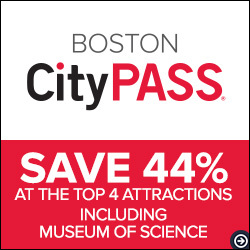 CityPASS is a great way to experience Boston’s top attractions and save 44% off the full price! Buy CityPASS here and get admission to the Museum of Science plus three other top Boston attractions: New England Aquarium, Skywalk Observatory at Prudential Center; Harvard Museum of Natural History OR Boston Harbor Cruises. CityPASS is valid for 9 days, starting with first use. Learn more. Available at the Museum box office or purchase online at citypass.com. Gain access to 40+ of Boston's top attractions and tours. Choose options from one to seven days to experience the Museum of Science, take a Fenway Park Tour, visit the New England Aquarium, enjoy a whale watching cruise, catch a thrill at Six Flags, and so much more! Learn more. Purchase online now at smartdestinations.com. Pricing varies according to the number of days purchased.